On 4th of July I got the opportunity to head to Atlantic City, NJ with my 4 year old to experince so many great new things they brought to the city in celebration of the 4th of July. We stayed at the BEAUTIFUL Golden Nugget Hotel. The rooms were spectacular. They had gorgeous leather "L"-shaped couches, great views and a very comfy bed. Very modern decor and GREAT bathroom amenities!! We met at the pool in a private area to meet folks from the Atlantic City Alliance. The ACA is a newly created non-profit entity funded and overseen by the city's casinos. Their mission is really to bring more tourism into the area by showcasing the great places in town-outside of the casinos. GREAT job in my eyes! I have to admit-I've NEVER thought of AC as a 'family friendly destination'. At ALL. But I have to give them big credit for really trying. And if you follow the hashtag #HowIDoAC on Twitter you'll see what a great time so many people are having! After meeting at the pool my son and I got cleaned up to head to Boardwalk Hall to the press dinner, viewing of fireworks, hearing Kevin Rudolf rock & checking out Atlantic City's hottest and newest attraction-a sound and light show called Duality. Duality is a permanent show occuring twice an hour after dark up until 2am all year long. 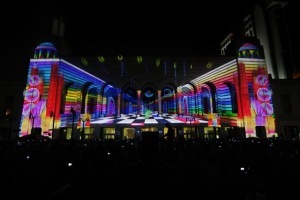 This isn't just 'any old light show'...this is a $3 million dollar light show!! You have got to check this thing out. AMAZiNG is not even the word for it.